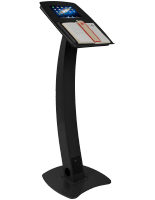 Looking for a standing fixture that can hold a touchscreen? 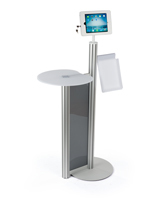 These iPad presentation stands all feature an enclosure for holding an Apple® or Android tablet. 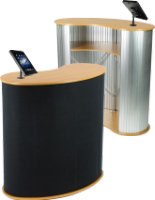 Each kiosk also has a desktop space for keeping other materials for events or lectures. 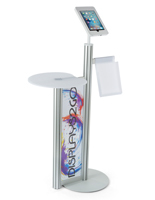 At trade shows, passersby can interact with the device to learn more about a company or the merchandise and services it offers. 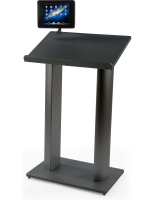 iPad presentation stands, or lecterns with iPad mounts can also be used in an office, classroom or auditorium for keeping notes for the speaker or displaying information to the audience. 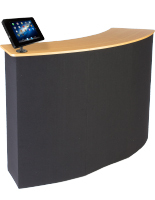 This type of counter comes in a number of designs that can be used for any application. 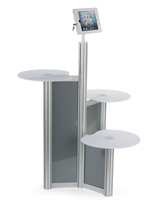 Each type of iPad presentation stand has its own features to meet any need! 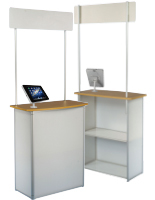 What design options are available with these podiums for touchscreens? 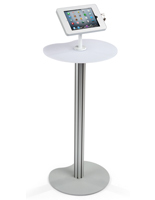 iPad presentation stands can have an oval-shaped tabletop and a folding layout. 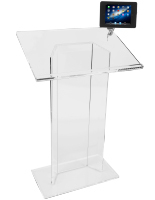 Podiums like these include a black or custom printed stretch wrap that creates a professional appearance. 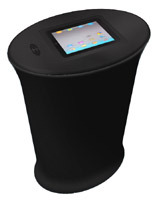 Devices lay flat on top and are partially covered by a magnetic overlay that keeps the speaker and charging port free. High quality counters like these are made of sturdy laminated medium-density fiberboard with a polyester wrap for withstanding heavy use. 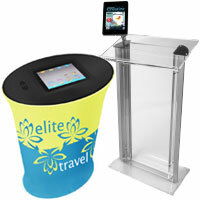 These are great for bringing to trade shows and events because they are easy to assemble and weigh only 14 lbs. making transporting them easy. These fixtures also include a carrying bag for further simplicity. 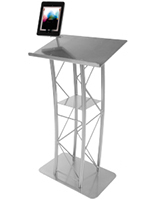 These presentation stands are also available with a simple “pulpit” style construction. 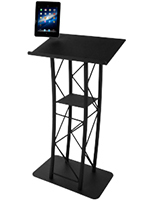 This design option is made of aluminum and steel and features either a black or silver powder coat finish. 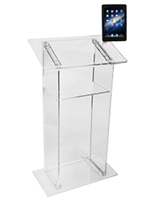 Each podium has an enclosure for a generation 2, 3, 4, Air or Air 2 Apple® device and an 11.5” x 11.5” area for books, notebooks and other reading materials. They hide the home button which keeps presenters from accidentally navigating out of the intended app. In addition, this type of fixture includes a cable management system for keeping power and audio cords out of the way. These models also have a locking case for preventing theft and tampering. 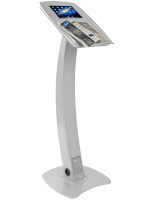 Presentation stands can also feature a large, angled reading surface with a raised tablet bracket. 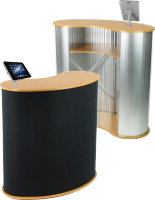 Lecterns with this fabrication can hold a large amount of reading materials that makes them great for lectures and office meetings. All models like these have an adjustable bracket that allows electronics to be displayed to the speaker as well as the audience. 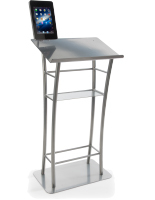 Some units feature an additional lower shelf for extra storage capability while others have a clamping enclosure that supports any Apple® or Android tablet that measures 10” wide or less. These are made of steel, aluminum or acrylic and have a silver, black or clear finish. These stands can feature a curved tabletop and a large shelf made of medium-density fiberboard wood. 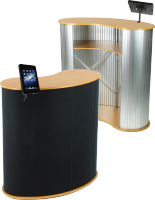 In addition, they have strong aluminum siding and supports that creates a sturdy display. 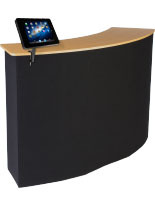 This type of larger counter is collapsible and includes a black Velcro fabric cover. This allows accessories like posters, pockets, signs and literature to be attached to the exterior for extra advertising space. Each has an adjustable bracket for electronics that can be locked for protection at public events. 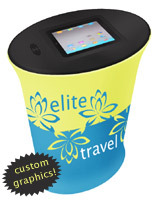 Made for trade shows, exhibitions and conventions, these portable kiosks come with a carrying bag that makes it easy to bring them from one place to another. 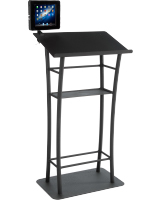 Stands with electronic mounts are made for integrating advanced technology with public speaking events. 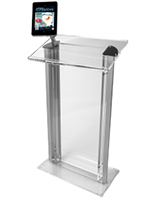 In a school, office or church, speakers can use these podiums for anything, from reading notes to controlling slideshows. 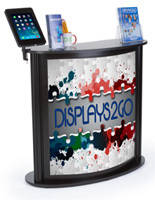 At trade shows and conventions, companies can use them to show passersby images, videos and interactive apps that will get them informed and interested. 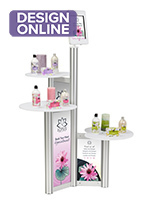 Additionally, counters like these can be used by businesses that require an interactive display or checkout area. 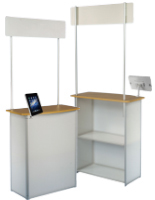 Portable exposition tables can act as cash wraps and will benefit employers with their large shelving space. 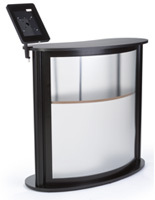 With the limitless amount of apps available, these kiosks can be used for checkouts, waiting lists, sign-in sheets and more in any establishment. When purchasing one of these units, make sure that it supports your generation or version of touchscreen; otherwise it may not fit.